Yoga has become a very essential component of the physical regimen for the paramilitary Forces and has received massive response from one and all. It has emerged to be a very profound way to de-stress the security personnel and also at the same time help them remain fighting fit. With this aspect, a 21 days long “Yoga Capsule Course” is being organised by BSF to trend its Jawans. Border Security Force (BSF) Guwahati Frontier in collaboration with Lakshmi Bai National Institute of Physical Education, (LNIPE), Sonapur, Guwahati is organizing a 21 Days long training programme have starts from 1st June 2016. 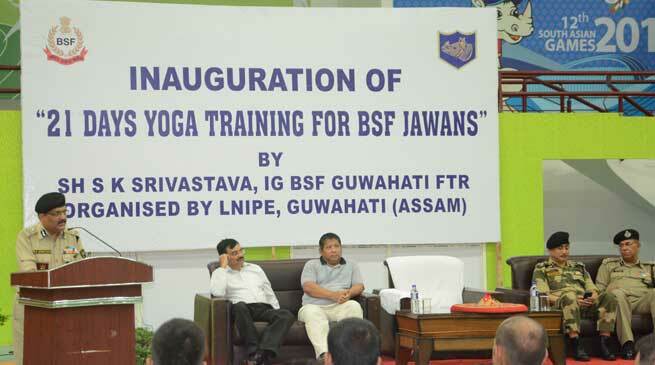 44 male and 16 female trainees from various BSF Battalions of Guwahati frontier have been selected for undergoing this 21-day “Yoga Capsule Course”. They will be trained by faculty of LNIPE, Guwahati, who have tremendous expertise on the subject. The program was inaugurated, on Thursday, by Sh. S.K. Srivastava, IG BSF Guwahati Frontier, in the presence of Shri B Basumatary Dean, LNIPE and other officers from BSF and faculty member of the institute. Sh S.K. Srivastava, IG BSF while inaugurating the yoga camp expressed his immense gratitude to the LNIPE for extending their support by way of imparting training and providing boarding & lodging for the trainees. This training will enable these BSF trainers to further impart training to Force personnel in the Battalions as well as their families. This training will also assist in the reduction of stress amongst the force personnel and enhance their performance as well as health. This is the second batch of BSF trainers who will be trained by LNIPE. It is worth mentioning that the trainers of the first batch carried out extensive workshops for the BSF personnel, their families and even the border population, earning accolade as well as good will from the participants. Moral boost up for security force….